Colorado homeowners are trying to get through their end-of-summer checklist as quickly as possible. That means turning off the sprinkler system, mulching, and, of course, cleaning out the gutters. Though it’s a pretty easy task, a lot of us put off this chore for some reason. 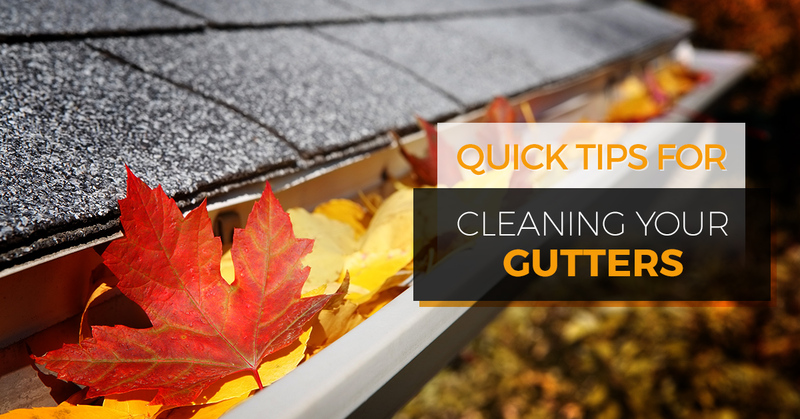 With snow just weeks away, it’s important to take care of your gutters now. Keep reading for tips on gutter maintenance and repair. Wear the proper attire – You probably don’t want to be wearing your favorite shirt when cleaning your gutters. Opt for something with long sleeves that you don’t mind getting a bit dirty. Don’t forget to wear rubber gloves before you begin. Use a safe, extendable ladder – It’s best practice to clean gutters while standing firmly on a ladder. Though a fraction of homeowners cleans their gutters from the top of the roof, it’s not recommended. As you work from the ladder, use one bucket for gutter debris and another for carrying tools. Make sure the area below the gutter is clear in case of an emergency. You may want to consider ladder “horns” to keep it from damaging the gutter. Use the right tools – Make things easier on yourself by using a small plastic scoop to remove debris from the gutter. Feel free to flush out finer materials with a hose, starting at the end opposite the downspout. Should the water not drain properly, check the downspout strainer again and clean as necessary. In order to avoid costly roof repairs down the road, it’s imperative to clean gutters. Doing so enables proper channeling and diversion of the rain off your roof and to the ground. Folks in Northern Colorado know that our weather can be harsh on roofs and gutters alike. Whether it’s snow, hail, heat, or wind, it’s no question that gutters take a beating. With that in mind, proper maintenance is vital to the health of your roof and home. Leaky gutters can cause rotten fascia board, damage the siding, create ugly water stains, and even cause erosion. Meanwhile, gutters without the correct pitch cause leaks, overflows, and too much weight for them to handle. Rather than put off cleaning your gutter for another year, put your trust in the premier Colorado roofing contractor. At Schroeder Roofing, we offer gutter services including repair, replacement, and installation. When you go to choose a Northern Colorado roofer, you have countless options. So how do you know which one is right for you? Schroeder Roofing has been around for more than 40 years, meaning we know the industry like the back of our hands. Our Colorado roofing contractors have unmatched knowledge and experience in asphalt, shingles, tile, flat roofing, metal, synthetic slate, and so on. From simple gutter repairs to a commercial/residential roofing overhaul, we can come up with a long-term solution for you. We are proud to be fully licensed and insured. Not to mention, we’re members-in-good-standing with the Better Business Bureaus of Northern and Southern Colorado and the Home Builders Association. Don’t settle for just any roofing company. Instead, turn to Schroeder Roofing for all your needs.